Family Web Log, Again. : Look what's for dinner! Emeth, in his fussy stage, often claims we are having poo for dinner, or that whatever is for dinner tastes like poo. So... if he thinks it's poo anyhow, might as well save some money and "recycle"... right? 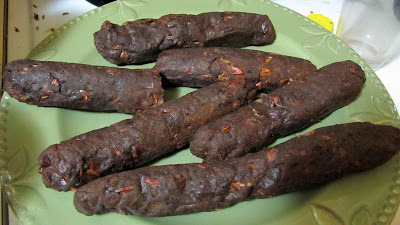 Actually these are the results of a seitan sausage recipe I tried today. The resemblance to a certain other substance is a bit unsettling! If you close your eyes, however, they smell uncannily like rather savoury hot dogs. "Spicy hot dogs", Emeth says. They don't taste overly spicy though. The flavour is pleasant, with a hint of maple. Amazingly enough these lovely things passed the kid-taste-test for both kids! This very nearly qualifies as a Christmas miracle around here these days. Here's the Smokey Maple Sausage recipe I used. Not sure why mine turned out so much darker looking than theirs. It must have been the extra black mushroom soy sauce I used. Also I didn't mash my beans as much as I could have, leading to the interesting extra texture and colourization.